Try this Garlic Rosemary Roasted Boneless Leg of Lamb or your next special occasion, such as a birthday! Sear to brown all sides. Birthdays in our family were relatively low key, unless you were my brother. We didn’t have parties, unless you were my brother. We didn’t get presents, unless you were my brother. What we did get, unless you were my brother, was the dinner of your choice. My father and I have birthdays that are only a few days apart and we both wanted leg of lamb, always. We’re also a pie family, unless you’re my brother, so homemade fresh peach pie was also our choice. Our birthdays are late September/early October – peach season! Rub the marinade all over. Tom, my brother, who by the way still celebrates his birthdays in big ways, has a July birthday. The bakeries in Rochester were closed in July back in the day. There were no big supermarkets that had bakeries either. Mom and I were always running around to the penny candy store looking for goody-bag fillings and trying desperately to get a cake, a Carvel ice cream always fit the bill. Somehow we always managed to pull it off and had fun doing so. It became comical. Roast low and slow. Cover and let rest 10-20 minutes before slicing. Dad and I stuck to our leg of lamb and peach pie routine for many years. I was reminding them about this recently, but they are both 90 and seem to have forgotten that tradition and my brother’s birthday antics. I’m visiting him soon and am going to see if he remembers! Don’t forget to remove the butcher’s twine! This is my favorite version of a leg of lamb. 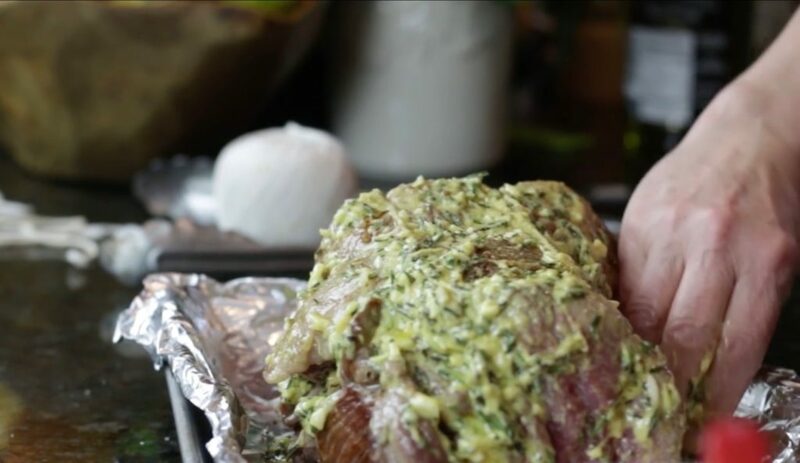 I love the flavors of the rosemary, garlic and Dijon mustard with the slight gaminess of the lamb. This cooking method is low and slow. As you’ll see in the video, the outcome is an evenly cooked roast that is very juice. My mouth is watering just writing about it! Slice and move to a warm platter. Click here for meat and poultry roasting chart and safe minimum cooking temperatures. 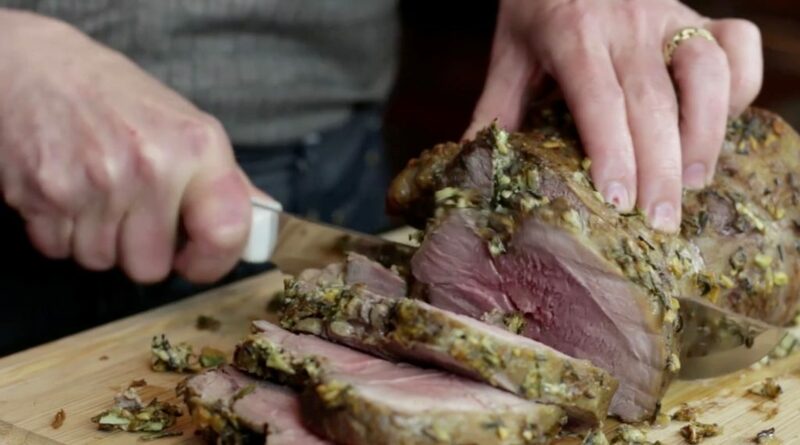 Watch the video for Garlic Rosemary Roasted Boneless Leg of Lamb here. This low and slow method of roasting provides an evenly cooked and juicy roast. I found that 25 minutes per pound worked well at the 275 degrees F. My four-pound roast was medium rare (135 degrees F) after 1 hour 20 minutes. I had left the roast on the kitchen counter for 2 hours before roasting. 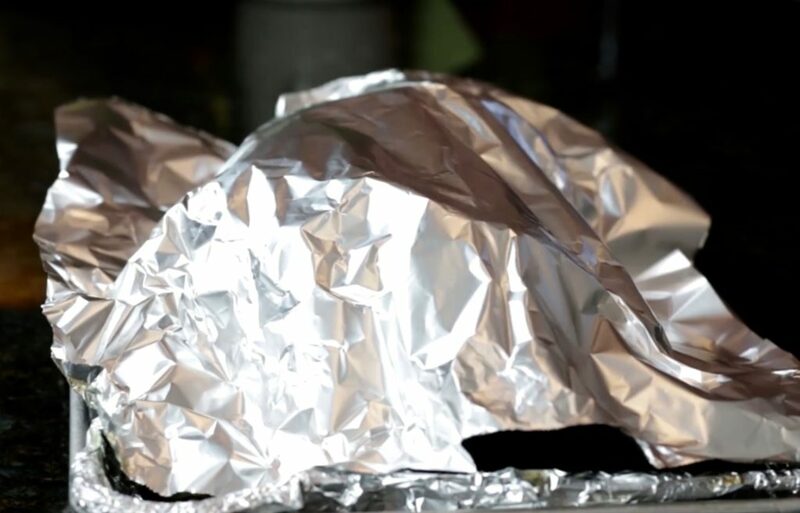 Line a 15-by-10-by-1-inch baking sheet with foil. Combine the oil, mustard, rosemary and garlic in a small bowl. 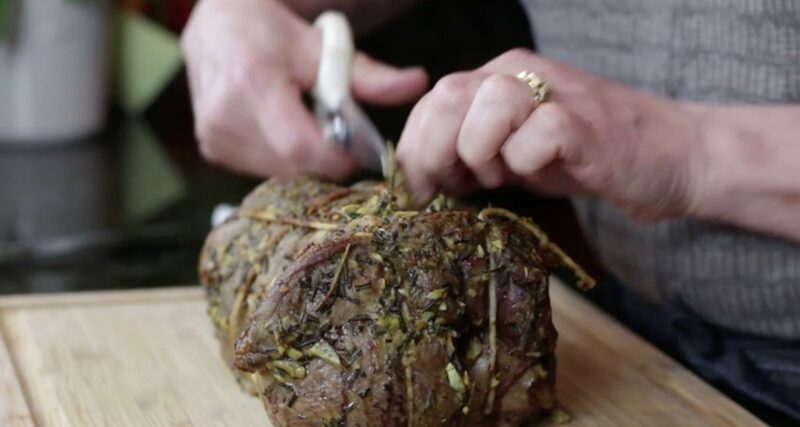 Roll and tie the roast with butcher twine, or ask your butcher to do it for you. Generously season the roast all over with salt and pepper. Heat a skillet large enough to hold the roast over medium-high heat. Pour in the oil and swirl across the bottom. Lay the fatty side of the lamb on the bottom of the pan and sear for 3 minutes. Turn one quarter and sear 3 minutes, repeat 2 more times with a quarter turn each. Place a good dollop of the marinade on the lined baking sheet and then place the lamb, fatty side up, on the marinade. Scoop the remaining marinade on top of the roast and spread all over the remaining 3 sides. Bring the lamb out of the refrigerator about 2 hours before roasting. Preheat the oven to 275 degrees F about 15 minutes before cooking. Place in the oven and roast for 1 1/2 hours for medium rare. Use a thermometer to check internal temps. Let rest for 10-20 minutes. Tent with foil if the weather is cool. Slice, place on a warm platter and garnish with rosemary sprigs.